SOUTH WILLIAMSPORT, Pa – Following the final out of the U.S. championship at the Little League World Series, Chandler Spencer embraced a sobbing Chase Anderson near the mound. The boys wore different-colored uniforms, bright orange for Spencer, yellow for Anderson. One was moving on to the world championship. One was not. Fans cheer before entering Lamade Stadium to watch the US Championship game. ~ photo by Erin O'Neill. As both teams made their way back to their respective dugouts in celebration and mourning, Spencer stood still on the infield grass, hugging his competitor and whispering words of encouragement into his ear. Certainly, the 2017 baseball season gave fans a lot to love. There was a rookie from the Bronx who broke Mark McGwire’s record for home runs in a season by a first-year player, a Cleveland Indians team that one-upped the “Moneyball” Oakland A’s by rattling off 22 straight wins, and a bunch of 20-somethings who brought Houston its first-ever World Series title. Even with all the magic this MLB season gifted us, some boys from Texas and North Carolina just may have supplied the best couple of games this year, at least until the sixth game of the World Series. Lufkin, Texas and Greenville, North Carolina, the two towns that represented the Southwest and Southeast regions in the Little League tournament, were hit by devastating hurricanes within a year of each other. In October 2016, Hurricane Matthew ripped up the East Coast and doused the state of North Carolina with 18 inches of rain. Ten months later, on the day of the U.S. championship game, Hurricane Harvey made landfall in Texas and eventually left Lufkin with a 13-inch deluge. Lufkin and Greenville thankfully didn’t take the brunt of the damage from either storm, but homes and local baseball fields were flooded, and power was cut in both towns. Cash Daniels-Moye, a player on the Greenville squad, had to stay with a teammate’s family for weeks because his family was evacuated. Many other parents from the Greenville Little League, meanwhile, opened their homes to those affected by the storm. As for the boys from Lufkin, they were in Williamsport at the time Hurricane Harvey tore through their hometown, so they had no idea what they would be going back to. All they could do at the time was try not to worry, play their hearts out and pump some joy back into a reeling state. Southwest's Collin Ross pitches in the first inning of the US Championship of the Little League World Series. ~ photo by Erin O'Neill. Hundreds of homes in their area lost power the day of the U.S. title game, but Lufkin Mayor Bob Brown said almost every one of the 36,000 citizens of Lufkin found a way to watch the U.S. championship. He said watching the team compete made everything else going on around the town secondary — at least for a moment. For both sets of 11-to-13-year-olds, the pressure was intense that Saturday afternoon of Aug. 26. The national championship was on the line. ESPN cameras were watching their every move and broadcasting them worldwide. And, back home, their storm-battered towns needed of smile. The boys didn’t want to disappoint. The U.S. championship game at the Little League World Series, with the winner heading to the tournament final against the international champion and the loser moving to the consolation, or third-place, game was actually the second meeting between North Carolina and Texas. It seemed unlikely to match the original for drama. When they first met, Texas and North Carolina were the only U.S. teams still undefeated, and they got there with different styles. Texas made its entrance a loud one, as it hit back-to-back-to-back home runs in its first game at the LLWS. It wasn’t just the top of the lineup, though. Texas scattered power hitters up and down the roster. The team cranked six home runs from four different players in its first two games of the series, in which they defeated Michigan, 5-1, and Connecticut, 6-3. Collin Ross and Hunter Ditsworth, who both tower around 6-feet-tall and weigh over 150 pounds each, represented the muscle behind the offensive machine. The power duo combined for three of the team’s first six homers. Ditsworth’s mammoth shot in Texas’ game against Michigan may have been the longest home run in the tournament, as it cleared the well-known first hill behind Howard J. Lamade Stadium’s outfield wall. North Carolina’s pitchers, meanwhile tossed a perfect game and a no-hitter back-to-back to open up the LLWS. It was the first time in LLWS history that a U.S. team recorded consecutive no-hitters. The self-proclaimed “Three Stooges”—Anderson, Matthew Mattijs and Carson Hardee—combined for 17 strikeouts and just two walks in their first two games. They may not have had the knack for hijinks the original stooges possessed, but they sure could make batters look silly. Anderson could hit the catcher’s glove with a blindfold on. Matthijs threw fastballs that reached 76 miles per hour, which equates to a 99 mph pitch in the big leagues. And Hardee, the hybrid of the two work horses, would come in to close if needed, with a heater close to Matthijs’ and a wicked curveball. John Beauge, who has covered every LLWS since 1957 as a photographer, reporter, or editor, said it was one of the most commanding pitching staffs he had ever seen in Williamsport. Greenville became the first team from North Carolina ever to start the LLWS off with two wins. It was a historic opening, but sustaining that level of dominance at the highest level of Little League baseball was, well, impossible. Through two innings of the first matchup between Texas and North Carolina, played under the lights of Lamade Stadium, Greenville looked as unsolvable as it had all tournament. Hardee blasted a solo homer in the first inning and Anderson breezed through the first six Texas hitters, sitting them down one by one. Then the third inning came, and something odd happened — North Carolina gave up a hit. Texas’ Mark Requena laced an opposite-field double to lead off the inning. Every player in the field looked around as if the sky was falling. Then something really odd happened — North Carolina gave up a run. A passed ball allowed Requena to reach third base and an RBI groundout to the shortstop tied the game at 1. But North Carolina wasn’t able to do so against Ditsworth, who was also Texas’ ace. He shut down the North Carolina bats for five innings and struck out eight along the way, but he couldn’t have done it alone. Ditsworth’s strong performance was surely aided by his special friend, Bree. No, it’s not his pitching coach or his mother or his girlfriend. It’s the name of his glove. Ditsworth brings Bree everywhere with him. Bree always got her own seat at the cafeteria during the tournament and even had her own pillow. The name Bree came from Ditsworth’s girlfriend’s middle name. Ditsworth and Bree left the mound with just one earned run allowed after five innings. Impressive indeed, but it wasn’t even the best pitching performance of the game. Matthijs relieved Anderson for North Carolina in the fourth inning and plowed through Texas’ high-powered offense with ease. He struck out 12 of the 14 batters he faced in the game and finished in style with 11 straight K’s. North Carolina eventually got to reliever Chip Buchanan in extra innings and slipped the game-winning run across in the seventh — the last inning played in the round robin section of the whole tournament — with a bases-loaded chopper to first that scored Daniels-Moye for a walk-off victory. Karl Ravech, who has provided play-by-play for the LLWS for 17 years and has covered Major League Baseball for ESPN since 1993, said on the broadcast that it was as good and as competitive as any baseball game he’d seen on any level. Fields said the win was even more rewarding than the two no-hitters because of how talented Texas’ offense was. North Carolina held them to just that one hit in the third. While North Carolina moved on to the U.S. championship game with an undefeated summer record still intact, Texas bounced to the loser’s bracket to play New England for the second time. But Texas showed no signs of emotional hangover from the gut-wrenching loss a day prior, as it plated eight runs in the first inning and trounced New England 14-4 to set up the rematch with North Carolina. The winner would play for a world title. With news of Hurricane Matthew nearing the Texas coast, the Lufkin boys put baseball aside for a moment and decided to make an encouraging video for their hometown the night before the biggest game of their young lives. The message was simple: This game is for you. With all the distractions surrounding the team, Texas had to fully refocus the next day if it was going to slay the giant. North Carolina still had Hardee and Anderson available to pitch in the game. Luckily for Texas, Matthijs wasn’t eligible to throw because his pitch count was too high, and so he could not take the mound, under Little League rules. For Texas, Ross got the nod on the mound. 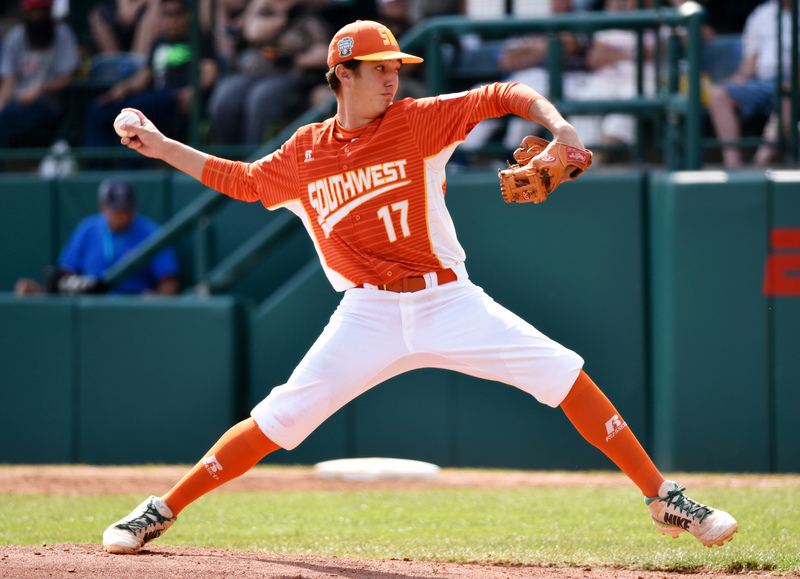 In his first appearance of the tournament — Texas’ first victory over New England — Ross gave up just one run and tallied eight strikeouts in a complete game win. It was evident from the first inning that Saturday the rematch would be just as mesmerizing as the first encounter. With North Carolina knocking on the door early, Texas third baseman Chip Buchanan made a spectacular two-out catch while running face-first into the padded green wall near his dugout to quell the opening threat. Then it was Texas’ turn to put the pressure on. Requena served a single the opposite way in the second frame for the team’s first hit of the game. He was still the only player in the tournament to get a hit off North Carolina’s three-headed monster. The rest of the field was 0-for-57 against North Carolina pitching to that point. Requena was now 2-for-2. Texas worked its way to get runners on second and third with just one out in the inning, but Hardee wasn’t fazed. He struck out the next two batters and escaped the inning with the game still scoreless. North Carolina used the momentum Hardee supplied to punch two runs across in the bottom half of the second inning and three more in the third. JoeJoe Byrne opened the game up in the third inning with a two-RBI single to left that was misplayed by Kolby Kovar and dribbled all the way to the wall. Bryne scurried from first to third base on the error and scored on an Anderson ground out to balloon the lead to 5-0, Greenville. Meanwhile, Hardee continued to dominate on the mound — until the lineup made its way back to Requena. With two outs in the fourth inning and Texas still down 5-0, “The Big Cheese” stepped in the left batter’s box and smacked another opposite field single. Requena now had three hits against North Carolina — all of them to left field. As rare as Requena’s performance was against this dominant a staff, Texas needed someone else to help him out. Wigley, the shortest player on the field, loaded up with all the strength his 5-foot frame could muster and cranked a 2-2 fastball over the centerfield wall. Texas players jumped up while their parents hooted and hollered. Their team had life. North Carolina started to unravel in the fifth. Hardee reached the 85-pitch limit with two outs in the inning, so Anderson was called in to relieve him. Anderson had been reliable all tournament as a starter, but with over 26,000 in attendance and millions more watching at home, this was a different animal. Deason welcomed Anderson to the game with an RBI single to cut the lead to two. As confidence began to build from the Texas bench, tension rose on the North Carolina side. As all that pressure mounted, catcher Bryce Jackson made an uncharacteristic mistake for North Carolina. With Deason on second base, Anderson threw a wild pitch that allowed the Texan to cruise to third. A flustered Jackson scurried to retrieve the ball and fired an ill-advised throw to third base in an attempt to nab Deason. The throw was off target and rolled into left field, allowing Deason to score and cut the lead to 5-4. It was just the second error North Carolina committed all tournament. Even with the mental lapse, North Carolina was still in fine shape. The team’s steadiest pitcher was on the mound with a one-run lead and needed just four outs to close the deal. The only issue? Requena was now on deck, preparing to hit after Ross. With yet another uncharacteristic mistake, Anderson plunked Ross in the head to bring Requena to the dish with a chance to tie the game. Only, he wasn’t interested in a tie. With all of Texas watching, praying for a much needed pick-me-up, Requena golfed a 2-2 pitch over the left field wall to give Texas a 6-5 lead. The normally stoic Requena couldn’t help but beam from ear to ear as he relished his home run trot. Both Anderson and Jackson came to the dish in the sixth inning with chances to redeem their previous slip-ups, but neither were able to reach base off Chip Buchanan. Daniels-Moye, with everything he and his family had gone through in the past year, stepped to the plate as North Carolina’s final hope. As resilient as Daniels-Moye proved to be, he couldn’t produce any season-saving magic. Buchanan got him to ground out to short, and the celebration was on. Texas had improbably exacted revenge to advance to the world championship the next day. Even down five runs to the most fearsome pitching staff in the tournament, not a soul in the Texas dugout believed they were done. The win sent the town of Lufkin into a frenzy, said Brown, the mayor. It was the perfect time for a burglar to strike, as nearly the entire population found a working television to watch their boys make them proud, he said. The storm back home was no match for the Thundering 13. Immediately after the traditional handshake line, Texas players and coaches ran to celebrate with their fans behind the dugout. But not Chandler Spencer. Spencer saw a disheartened Anderson tearing up after giving up the game-winning run, so he walked over to comfort him instead. Spencer didn’t see an opponent, an enemy. He didn’t see a member of a rival team Texas was determined to conquer. He saw a friend in need. He saw Anderson — his head down with his cap pulled over his face to shield the tears — plodding toward his dugout. Chandler stopped him in his tracks and draped his left arm around his pal. The two heartstopping games against each other seemed to take a toll on the American teams’ play the next day in their respective matchups. North Carolina lost 14-8 to Mexico in the consolation game as Fields emptied his bench in a hat tip to the hard work of all his players. Texas, meanwhile, went into the title game against Japan without much pitching depth — it had all been used against North Carolina — and it showed. Both Ross and Ditsworth were ineligible to pitch, and Buchanan and Deason were roughed up for 14 hits in less than five full innings. The Japanese team from Tokyo won easily, 12-2. But after all Texas had been through, it hardly seemed to matter. “[I told the team after the game] to hold their heads up, get your shoulders back. They have nothing to be ashamed of. They competed. We did all we could do all tournament and all summer, and I’m very proud of them,” Maddux said. Fields kept in communication with the Texas team as it made its way back to Lufkin, making sure everything was OK back home. Thankfully, none of the players lost their homes due to the hurricane. Over in North Carolina, Daniels-Moye and his family are living in their own home and the town of Greenville is back on its feet. Both teams showed the country that adversity is no match for perseverance. Greenville players endured flooding in their hometown and just 10 months later put together an undefeated summer until losing in the U.S. championship. Lufkin heard of the danger Hurricane Harvey posed to their hometown the night before the biggest game of the players’ lives. After a slow start, the boys fought back to win and place as the second-best Little League team in the world. And both clubs gave baseball fans across the country, and more importantly, their hometowns a reason to smile again.